#1. Vampires are out of Mystic Falls, which means certain people can’t get back home (even though Caroline, especially, seems to want to). Matt Donovan may be the most powerful guy in town now, hanging out with a bunch of do-gooders who don’t have a lot of good to do, because, you know, no vampires. This is also where Eureka’s Colin Ferguson comes in as a new character to the series. This lack of vampires also means that a night out in the Mystic Falls woods might be a lot safer than it used to be. Emphasis on might. #2. 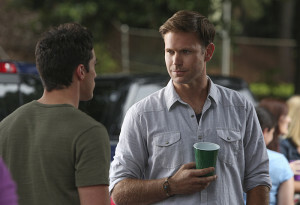 Alaric is back! I don’t know how someone who’s been dead gets a new teaching job, but sure enough, he does, and that also means he falls back into being the “dad” on the show, in a way. That might come in handy, because Tyler’s temper is flaring up yet again. #3. Everyone seems scattered and in different places here. Of course, we know where Bonnie and Damon ended up, but Stefan’s out of town, Elena’s got her own thing going on, Caroline seems to want everything back the way it was, and Jeremy is just hanging out, playing video games and doing other things to keep his mind off of Bonnie being gone. Everyone has different ways of dealing with the loss. #4. 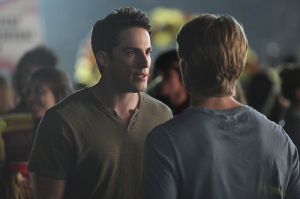 Elena will interact – or at least try to interact – with at least one of the brothers. #5. Tyler might have a new love interest. #6. Stefan gets a job. Sounds interesting? You can see it for yourself tonight at 8. Come by our forum to join the countdown, and if you want to see some photos from the season premiere, you can find them here.